The calm, sunny morning provided ideal conditions to glide through a myriad of channels and islands on five different lakes towards our next encampment on David Lake. As our canoe slipped closely by some Canada geese, their hubbub of complaint and the mad paddling of webbed feet greeted us as they scurried to the far side of the lake and beyond. 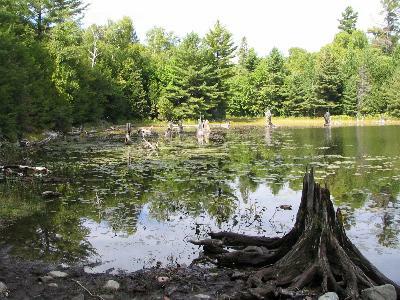 Initially, we didn’t realize that a beaver dam at the end of Johnnie Lake was P6L300 (206 to221). A sign posted on a tree above the dam indicated that this trail was not the portage and that it was located further along the head pond. We followed the instructions diligently, stowing our gear and paddling a short distance to an area of shoreline that appeared to be well used by previous canoeists. We unloaded and climbed the embankment and found ourselves back on the trodden path the sign had indicated was not the portage. The path led us to the beach on Bell Lake and there an outfitter informed us that the original portage trail was located next to the parking lot. Over the years, a new path evolved at the dam and, fortunately for us, this trail passed by the luxury privy provided by the Ministry. We pushed out onto the calm surface of Bell Lake and followed the right shoreline until we passed between campsites 79 and 89. It was imperative now to keep to the left and enter the narrows towards Three Mile Lake, otherwise, we would have paddled smack into a wetland beaver haven outside the park boundary. Since the water level was low and smaller islands were not always included on the topo, it was important to constantly scan the park map and the landscape. A lone loon danced on the water. Her webbed feet slapped the surface and with her flapping wings outstretched, she frantically called out our approach to Three Mile Lake. The landscape unfurled in a seemingly endless flag of spruce, contorted coves and inlets and shallow twisting feeder streams that took us deeper into the interior of the forest. The smell of conifers permeated the still air. There was something soothing and reassuring about the ripple of water parting the bowline with gentle lapping curves on either side of the canoe. In our approach to our next portage, we entered into a mysterious, placid cove that contained sunken logs in a shallow waterbed. The scenery along the intimate serpentine stream was absolutely picturesque. It eventually led us to a beaver dam and impassable forest. Without the knowledge of the trolley car and its tracks used for portaging P7R30 (221 to 224), we probably would have thought the wrong cove had been entered. 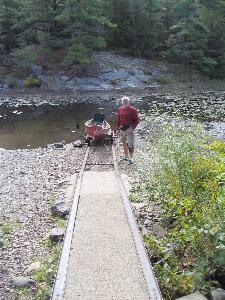 The beaver stream was exceptionally low to utilize the trolley car without marring the canoe. 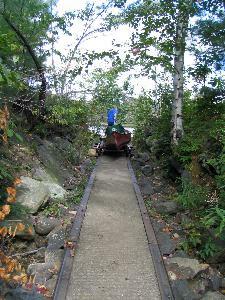 Our gear was carried over the knoll in one trip and for nostalgia sake we hauled the empty canoe on the trolley rail. A bewildered looking kayaker stood on the knoll as we gingerly completed our feat. 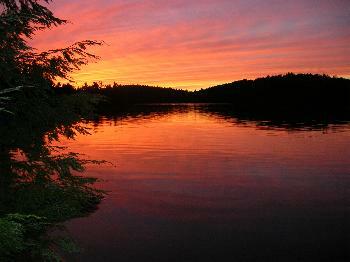 He was returning from Balsam Lake and had gotten lost among the marshes and islands. Fortunately for us, the appropriate route was traced on our map. We assisted in the placement of his kayak on the trolley, without the need to empty its contents, and transferred it overland. The winding S-channel allowed our canoe to glide undisturbed, snaking through the heart of a wavering garden of wetland of lily pads, strands of algae, cattails, stumps and troll grass beneath Balsam Lake – muddy humps would occasionally show legs and scamper into a far murk of this pristine and peaceful section of the lake. A large blue heron shouted out its guttural "quok, quok" and took flight from its one-legged stance from the shadow of a leaning cedar, sweeping out into the open over the trees to a safer haven. 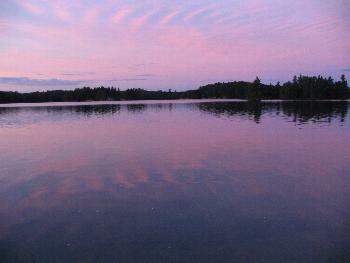 At a specified turn, island campsites 117 & 118 came into view at the end of the lake. Behind the isle and in and around a couple of coves, we approached picturesque P8L665 (224 to 238) and its adjacent bay, splotched with weathered stumps, sleepers and lily pads. 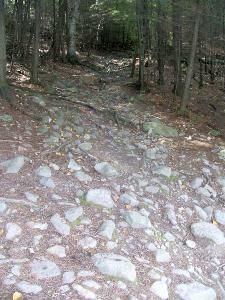 Apart from the beauty of the area, the commencement of the steep, washboard portage terrain took us by surprise. We took up the challenge for a backbreaking workout and used the level ridge at the top as our halfway point. The second segment was just as enduring down its precipitous slope. There is nothing more enticing than the coolness that comes from nearing water and seeing light ahead through the trees and branches - David Lake was now in our grasp. David Lake rewarded us with an outstretching view of Silver Peak amidst a clear blue sky. We now had the task of locating our campsite for the night. Among the islands, the outbuildings of a private cottage owner were situated on several outcrops. In the background, a planer and a chain saw wailed out, disturbing the peace and quiet of this remote wilderness. It was only after we had set up camp at site 99 that reality really began to set in. A floatplane landed on the lake, probably transporting building supplies, only to roar out onto the lake again and take off into the horizon. When it disappeared and we could no longer hear its engines, Wayne exclaimed, "Ah, the quiet of the forest"! What a disappointment to have such noise on one of the most popular and serene lakes in Killarney Park. 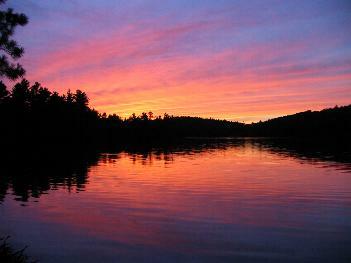 As a true canoeist, it would be very difficult to share this jewel with fly-in tourists. Hopefully David Lake doesn’t become a Muskoka or a Temagami. 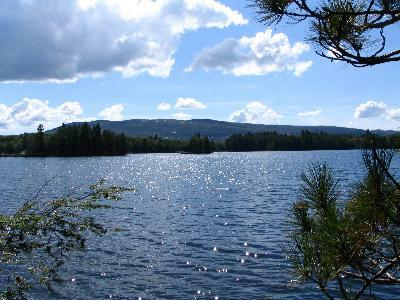 These lakes have been ruined by the overabundance of motorboats, tourists staying at outfitters in the interior, floatplanes flying in and out of the lakes and generators operating at most remote cottages. 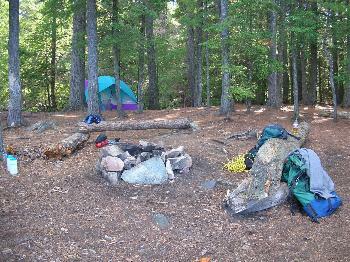 Our intention was to camp on site 104 on the westerly shore of David Lake next to the hiking trail to Silver Peak; however, it was already occupied. Out in the middle of the lake, we met a solo canoeist with binoculars in hand seeking a campsite and another couple in a canoe nearby doing the same – there were no vacant sites left in this area. We abandoned the idea of finding an ideal campsite and made a quick jaunt back to campsite 99 - quite suitable for our purpose. 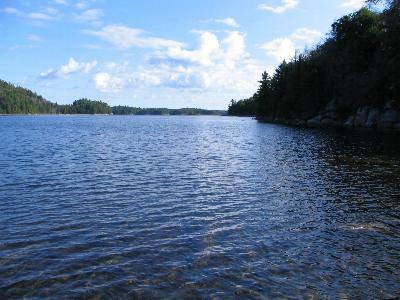 Our island site featured a magnificent azure blue sky with background vistas out over David Lake and beyond. 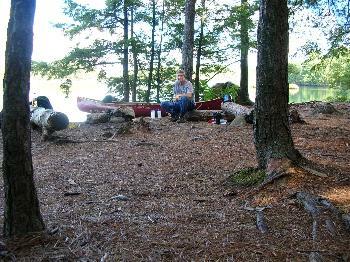 After setting up camp, we ate lunch in the company of two deer mice, and we skirted the inlet shoreline to gather firewood. We noticed a canoeist intently watching a muskrat hidden within the bushes and grasses of a small island. We introduced ourselves and learnt that Steven was a mechanic from the Ford auto plant in St. Thomas. We exchanged canoe stories and learnt that he was in the next campsite and was soloing around the park – what a challenge and adventure. We had just settled into a warm hearty supper around a crackling campfire when suddenly, we were bombarded for the next hour by the drumming of a generator, vibrating and echoing from the direction of the private cottage across the lake. We looked at each other in amazement. When the noise finally ceased, other campers could be heard shouting out their frustrations towards the cottage owner. We were treated to a spectacular sunset when intermittent clouds gathered to create a menagerie of purple against an orange afterglow. 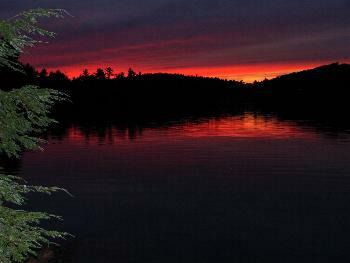 Its reflection upon the lake, with the "picket fence silhouette" of black spruce as a backdrop, was gratifying. Soon the hills disappeared into the night. Gray cloud layers prevented the full moon from competing with the constellation of stars; however, the warmth of a campfire and a wee dram of Yukon Jack made up for it. The hike up to the top of Silver Peak in the morning had us turn in at 9:30 pm. We laid in our sleeping bags and listened to the haunting call of distant loons, the quaking of mallards and the medley of various insects.